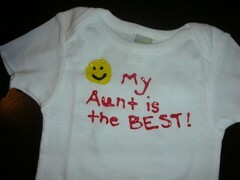 Nicole's Needlework: Baby Shower Fun! 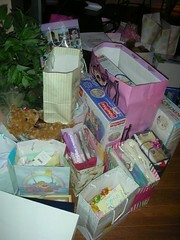 I just got back from my SIL's baby shower. It was a lot of fun. She got a TON of stuff! And it's so funny because it's all PINK! She's not a pink person. I tried not to get her anything pink (except pacifiers). You could tell the thing she loved most was a brown diaper bag she got! :) I won the guess the belly size prize. I just measured myself and added a little bit - she's not very big at all! We all decorated onesies. My brother is going to lose his mind when he sees all the presents! 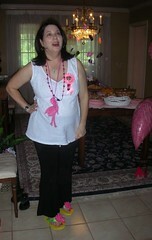 It was a flamigo themed party - look at her shoes! Well, dh took the kids to my MIL's house. So I've had a couple hours of peace, which is nice. It will be ending very soon though! :) I should be sleeping instead of blogging! LOL! :) Write later! oh wow! what a brilliant idea to decorate the baby vests ... onesies. We don't have baby showers over here which is a shame as they look so much fun. I just discovered your site.Many good wishes for your baby and enough time for your stitching! Nice to see US style designs. I love them. Fortunately we find some here in France, and I'm a long time suscriber to a US Xstitch magazine. My site is written both in English and French.